Viking Cold Solutions, Inc. conducted a Measurement and Verification (M&V) study of its thermal energy storage (TES) technology installed in a 93,000 square foot industrial low-temperature cold storage warehouse owned by Dreisbach Enterprises in Richmond, CA. The objectives of the M&V study were to determine the effectiveness of TES on energy efficiency and temperature stability with an ammonia-based refrigeration system. 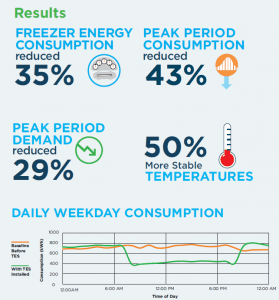 The M&V study concluded that TES provided a 43% decrease in peak period consumption and a 29% decrease in peak demand while improving overall temperature stability by 50% in a low temperature warehouse. Download THE Study to understand the benefits of OUR CUTTING-EDGE THERMAL energy storage TECHNOLOGY. Video: case study facility owner describing the TES results. Video: Ice cream distribution warehouse owner describing the benefits of TES. More videos, case studies, white papers and other resources here.